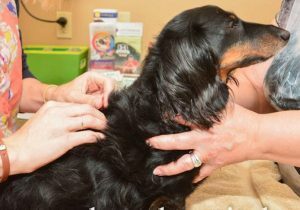 Abstract: Buddy is a 9-year-old MN Dachshund who presented for acupuncture consultation for a left forelimb lameness that had not improved despite medical management (pain medications, muscle relaxants, rest). Buddy had imaging (radiographs) performed that was overall unremarkable with the exception of some mild disc space narrowing (C6-7, T11-13, 4-6). I treated Buddy with weekly acupuncture for a total of 6 treatments. I targeted myofascial restriction in his neck and surrounding his left shoulder (specifically his pectoral muscle), as well as used points to regulate his sympathetic/parasympathetic nervous system and overall decrease inflammation. Bladder points were used based on his day to day back pain which may be attributable to the mild disc space narrowing seen on imaging but may also be secondary to his lameness. It took three treatments before Buddy’s owner began to see an improvement to his lameness, but by the end if his 6 sessions Buddy’s owner no longer noted lameness and his mobility was drastically improved. Buddy is a 9-year-old MN Dachshund who was originally presented to one of the other doctors at my practice on 1/31/18 for forelimb lameness that began after a fall while in the car (car stopped abruptly and he fell off seat into floorboards) one month prior. On examination Buddy was painful on extension of the left shoulder and had a BCS of 7/9, but no other abnormalities were identified at this visit. Radiographs were taken of the thorax and both forelimbs. No cause for lameness was identified in either forelimb or the thoracic spine. Buddy was prescribed meloxicam, dasequin joint supplement, and rest. Weight loss was also recommended. Buddy returned for re-evaluation with the same doctor on 5/30/18 for continued forelimb lameness. It was difficult for the owner to identify which forelimb was lame, but the lameness was intermittent and appeared worse in the afternoons. Again, Buddy was painful on left shoulder extension and appeared to tense mildly on spinal palpation around the TL junction. Radiographs were taken of the entire spine and it was found that the C6-C7 intervertebral disc space is slightly narrowed. There was also narrowing of the T11–T 13 and to a lesser extent L4–L6 intervertebral disc spaces. Methocarbamol was prescribed. Buddy returned again on 6/13/18 with the same doctor to discuss continued lameness despite rest and anti-inflammatory medication (meloxicam). Addition of Methocarbamol at the previous visit did not show any improvement. Other pain medication options were discussed at that time (transition to prednisone following wash-out from meloxicam, add in gabapentin) and acupuncture offered. Owner elected to try acupuncture and scheduled her first visit to see me on 7/5/18. At his first visit with me on 7/5/18, Buddy’s owner described his lameness in more detail. She was now able to definitively say it was his left forelimb that he was lame on. He would start each morning without any appreciable lameness, but by mid-afternoon he would become moderate to severely lame on the left forelimb. Increased activity during the day (ie. Longer walks, playing with other dogs) worsened his lameness, and so far, none of the medications prescribed had decreased the severity or frequency of the lameness. He was no longer taking any medications at that time. Myofascial exam – taut bands along dorsal cervical musculature and omotransversarius (right worse than left), left suprascapular m.
Repeated myofascial examinations revealed taut bands in pectoral muscles bilaterally with left much more pronounced than right, Lattisimus dorsi tension bilaterally, and firm band just dorsal to cranial aspect of left scapula. Haircoat change starting at ~C67/7 and extending rostrally that gradually improved at each visit, and owner saw improvement day by day with skin rolling at home. Differential diagnoses: myofascial restriction of cervical musculature causing decreased blood flow/pinching of peripheral nerves to the left forelimb vs. Mild left sided IVDD at C6/7 vs. Soft tissue injury/pain at pectoral m.
Medical Decision Making: Based on physical exam findings and imaging history I identified the left forelimb as the source of lameness. My myofascial examination initially indicated treatment of the neck and musculature surrounding the left shoulder. Each visit I used my myofascial exam to guide placement of needles in taut bands to treat local myofascial dysfunction. I used GV14 and GV20 to target the central nervous system and balance the sympathetic/parasympathetic nervous systems. I used BL10 to target cervical spinal nerves peripherally. ST36 and LI4/LR3 were used as anti-inflammatory and distal peripheral nerve input. Spinal palpation was used at each visit to choose relevant bladder points to target any spinal pain found that day. Due to concern for needle penetration into the thoracic cavity, massage was used to target taut bands palpated within lattisimus dorsi m. bilaterally. Visit 3 (7/19/18): GV14 – .16 x25mm uncoated kingli, BaiHui – 0.16 x25mm uncoated kingli, BL10 (L&R) – red serin x30mm, Taut bands in the regions of SI11 and SI12 (L) – red serin x30mm, L pectoral – red serin x30mm (fell out once, replaced once), ST36 – red serin x30mm. Skin rolling of cervical spine and trigger point release massage of taut bands in neck performed. Showed owner how to skin roll so she could perform at home. Outcomes, Discussions, and References: Buddy’s owner kept a detailed journal to objectively assess how Buddy’s lameness was impacted by his acupuncture treatments. She found no change to his lameness following the first two treatments (he continued to be sound in the morning, but by mid-afternoon would be grade III/IV lame on the left forelimb). During his third treatment, a taut band was palpated in the left pectoral m. and targeted locally with dry needling. 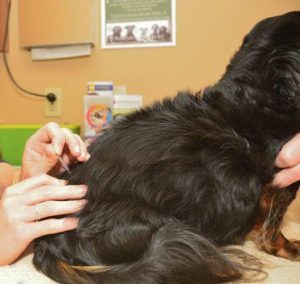 Following this treatment, Buddy’s owner saw a dramatic improvement. Buddy returned for three more sessions, with his owner noting that after the 4th session he was able to go up and down stairs and play with other dogs without becoming lame later in the evening (something he had not been able to do for quite some time). Buddy returned for his annual exam and vaccines on 10/2/18 and his owner reported that he continues to do very well, and only seeing mild lameness once every 3-4 weeks. In researching scientific literature that relates to Buddy’s case, I found a systematic review of studies that investigated the efficacy of acupuncture in myofasical pain syndrome1. This systematic review found that patients had better outcomes (reduction of pain intensity) when specific myofasical trigger points (taut bands) were needled versus when traditional acupuncture points and/or sham points used. I find this interesting because Buddy’s owner only noticed improvement after a taut band was located and treated in his left pectoral muscle. I believe the treatment of this taut band is what lead to his overall improvement which not only correlates to the findings in this review but also highlights the importance of a thorough myofascial exam at each visit. 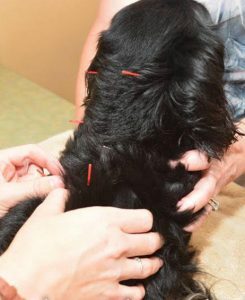 Describe Your Impressions of this Medical Acupuncture Experience: Buddy was my very first case after completion of my clinical intensive and graduation from vet school. I feel that I likely missed the taut bands in the pectoral muscles and the haircoat change in the neck at his first visits, but became more attuned and observant with each session. I enjoyed learning to integrate my myofascial exam alongside my regular physical exam, and seeing the drastic improvements in my patient after finding and targeting specific areas of myofascial restriction. I am very pleased with the improvement his owner has seen, and our ability to manage his pain without the need for any pharmacologic intervention. 1. Wang R, Li X, Zhou S, et al, Manual acupuncture for myofascial pain syndrome: a systematic review and meta-analysis, Acupuncture in Medicine 2017;35:241-250.